Many dentists place porcelain-fused-to-metal crowns on front teeth. While these crowns are white on the front, they have a metal foundation to help give them strength. There are a couple of problems with a crown with a metal foundation. The first is that an opaquer must be placed over the metal to mask its color. That can make the tooth look pasty or chalky. The second is that unless the crown is made by an exceptionally skilled ceramist, such as the one we have, there will be a darkening effect produced by that metal at the margin of the crown—where it meets the tooth. This is at the gumline. That dark line can be camouflaged by keeping it under the gum. The problem is that our gums tend to recede as we get older, so that dark line can later show up. Besides being ugly, the dark line is a giveaway that the teeth are fake. Dr. Newkirk prefers all-porcelain crowns on front teeth. They can be made the same shade, texture, and translucency as your natural teeth and are the closest we can come to a totally natural look. 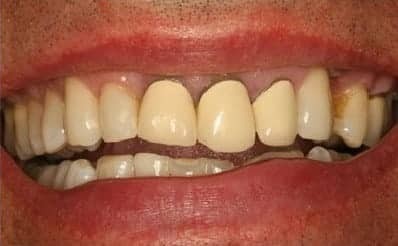 Even from close range with the trained eye of a skilled cosmetic dentist, it can be difficult to pick out a false tooth in a smile if it’s made out of pure porcelain. Let’s illustrate with a case done by Dr. Newkirk. In the patient photograph above, it’s pretty easy to pick out the crowns. They’re on the patient’s two central incisors and one lateral incisor. The color is flat, and he has that characteristic dark line at the gumline beginning to show. This is a typical look for porcelain-fused-to-metal crowns. Here Dr. Newkirk replaced the old dental work with beautiful all-porcelain crowns and some porcelain veneers to complete a smile makeover. 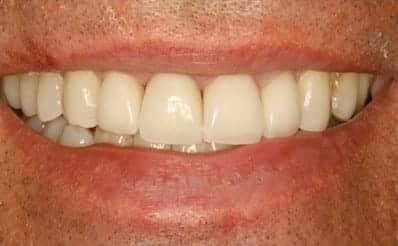 Can you tell which teeth have the porcelain on them and which are completely natural? It’s practically impossible to tell. If you would like to find out if all-porcelain crowns can transform your smile, give us a call at 630-717-9499 or click here to request an appointment online.